A group of 200 Palestinians, backed by foreign activists, have been erecting an outpost in the disputed E1 zone, near Ma'aleh Adumim, since the early hours of Friday morning. 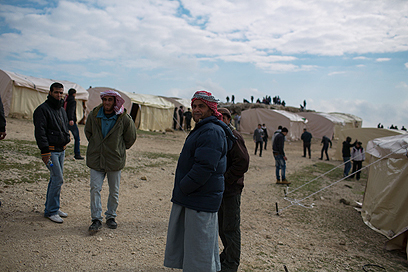 The Palestinian outpost, named Bab al-Shams ("Gate of the Sun"), contains 50 tents. 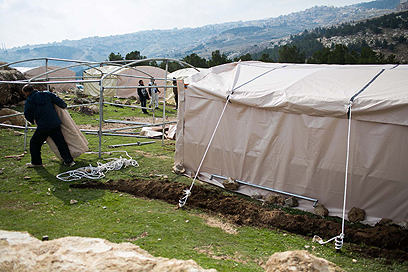 Mahmoud Zawara of the Popular Palestinian Committees told Ynet the tent encampment was being set up as part of the Palestinian "struggle." He said "we chose this specific area because it is conquered Palestinian land and places a wedge between the northern and southern parts of the West Bank." Zawara said the camp will be used by the Popular Palestinian Committees during activity in the Jordan Valley area in the coming days. "I hope the encampment will be permanent and remain in the E1 area," he added. Zawara said the Palestinians do not plan on confronting Israeli security forces, who have yet to arrive at the site. "We came here in the framework of non-violent resistance; we will not resort to any kind of violence," he told Ynet. 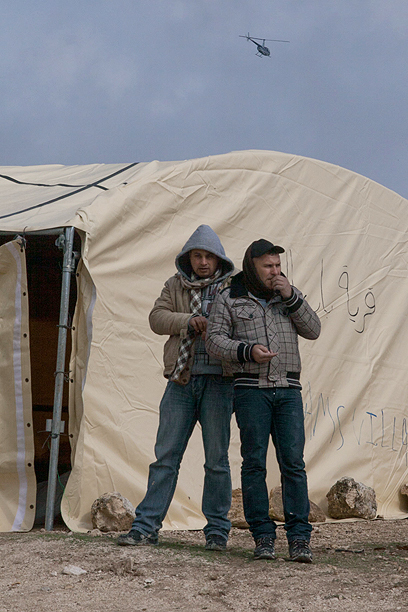 "According to international law, and even Israeli law, the Israeli army cannot prevent us from pitching tents." Zawara said it was possible that IDF and Israel Police forces would eventually evacuate the Palestinians, but expressed hope that "today will be a day without violence." Bab al-Shams is the name of a novel by Elias Khoury about the life of Palestinian refugees in Lebanon after the Independence War of 1948. A little more than a month ago the Israeli government approved plans to advance construction in the E1 zone, which connects Jerusalem and Ma'aleh Adumim, as a response to the UN's recognition of "Palestine" as a non-member observer state. The move drew harsh criticism from the West, including the US, with European countries summoning Israeli ambassadors to express their condemnation of Prime Minister Benjamin Netanyahu's decision to move settlement construction ahead in E1. However, the Right has accused Netanyahu of postponing the construction plans. See all talkbacks "Palestinians erect outpost in E1 zone "